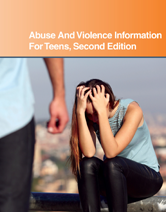 Abuse And Violence Information For Teens, Second Edition, discusses contributing factors and warning signs for the most commonly experienced types of abuse and violence. Facts about seeking medical care and mental health services for the physical and emotional consequences are also included. Chapter 40—How Can Domestic Violence And Abuse Be Prevented And Treated? Chapter 44—Is Your Relationship A Healthy One?